Perhaps the best-known section of University Drive in Lauderhill is South Florida's very own Koreatown, home to a handful of the county's best barbecue restaurants and specialty markets. At the center of it all is Gabose Pocha, a 14-year-old restaurant that's the original landmark. There's more to Korean food than just barbecue, and Gabose owners Susan and Fred Kim aim to show you that with their newest concept. Styled after a traditional Korean pub, it's Susan's interpretation of a Korean pojangmacha, a type of tarp-covered street bar that sprang up after the country's liberation from Japan in 1945. Here you won't find yourself in a makeshift tent, but you will discover that many of the items are sourced straight from Korea, including the metal dishes, cups, even the gas-lit tables where you're seated. Adding to the experience are the servers, who converse softly in Korean; a fish tank housing live sea snails that gurgles near the exposed kitchen; and spunky Korean pop music in the background. Start with the fresh-catch offerings like nakji (Korean octopus), abalone, and sea cucumber. These are sold at market price and delivered from Korea. Follow up with samgyeopsal, or barbecued pork belly, cooked in a steel pan at your table so you can watch fat slowly caramelize to a gooey-sweet gummy sauce. Pair it all with a shot or two of soju. 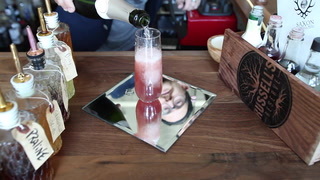 Or try Fred's shrubs, a Korean cocktail made from fermented fruit, vinegar, and Korea's distilled rice liquor.